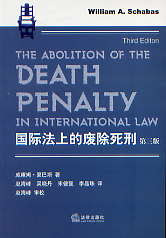 This is the Chinese translation of my book The Abolition of the Death Penalty in International Law, just published by the Chinese Law Press, which is said to be the top legal publishing house in China. It was translated by Zhao Haifeng, who worked at the Irish Centre for Human Rights some years ago, and who is now dean of the College of Law at the Harbin Technical University. The debate continues to progress in China, and it is my hope that gthe availability of books like this will influence opinion in the right direction. The translation was made possible by generous support from the Irish Department of Foreign Affairs.